I’m 78. Do you know how weird it is to see the Russians as :the good guys? Often, I find myself admiring their stance. This is great! Is there any chance that an Avaaz, or a 38 degrees, person would start a crowd funding initiative to assist Vermont in their fight to keep their people GM free should they wish? I’m old, decrepit and ignorant. Please one of you young things go for it. 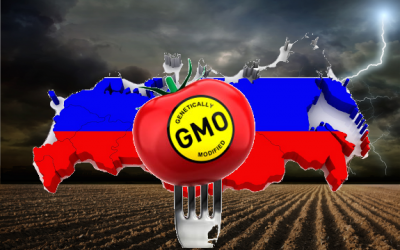 Good for Russia, doing 100% better than USSA..oh wait..this is the HOME of MonSatan, “Monsanto Protection Act” – 2013. I looked up the conversion rate of 20,000 rubles – it is $635.56 CAN and $582.35 US . Hardly a deterrent fine amount for multinational BigAg and biotech corporations! Can I make a suggestion as an editor? All of the Natural Society journalists need to work on their writing skills, starting right away. You lose credibility when your language is inflammatory, when you use complex words for simple concepts to try to make yourself sound smarter, when you misuse words and let grammatical errors slip, etc. But it’s mostly the strident tone. If even I feel skeptical or wonder about the facts after reading one of your articles, you’ve lost your core audience. If the tone is at all strident, you’ve also lost any chance at persuasion — your site becomes no different from a fringe version of Fox news, bent on riling people up. Let people get angry based on the facts, separate from your righteous indignation. This is important stuff, so it’s crucial that any information is conveyed accurately, clearly, and without negative emotion. I hope you’ll think about it, anyway. You find this article strident? I find it amazingly calm and reasonable. As to GMOs, strident is the least we should be. The goal, along with geoengineering, is to destroy nature. Hundreds of cities worldwide are hosting events, google March Against Monsanto Events to find the one nearest you and join millions marching to save the pollinators and take back our food!! In the 70′ & 80’s, I worked with a man that grew up in Nazi Germany and he was seeing parallels, in America, with what occurred in Germany in the 30’s and 40’s during the rise of the Nazi regime. The underlying climate of blame and deception by leadership has remained the same. Read the Fourth Reich. Under paperclip, we imported the Nazi scientists and leaders and we are the Fourth Reich. GMO’s are the equivalent of bio-terrorism. Bravo for this exemplary display of leadership! Synagogue of Satan JEW WORLD ORDER Poisonous GMO Foods.